Out of a mixture of modesty and misinterpretation sportsman often talk up luck. Sailors are no different, but on and opening day to Hempel Sailing World Championships Aarhus 2018, when the words “shifty”, “tricky” and “lucky” were thrown about the boat park faster than in a Vegas casino, the cream rose to the top. 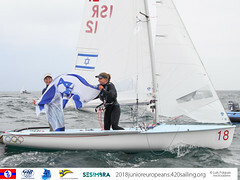 Only one race was possible for each of the two men’s 470 fleets (the 130 sailors in 65 boats were split into two fleets), but the first was won comfortably in the end by the Swedish 2018 European Champions, Anton Dahlberg and Frederik Bergström and the second by the Greek bronze medallists in the 2016 Rio Olympics, Panagiotis Mantis and Pavlos Kagialis. 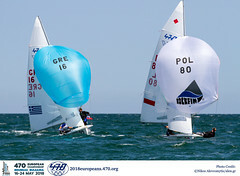 Behind the Swedes, the Australia’s perennial favourites, Mat Belcher and William Ryan, came back from 14th to finish strongly in third. The silver medallists in Rio, gold medallist in London 2012, and winners of the last two World Championships, kept patient and chipped away on each beat and run. Watch the Men's 470 races. The women’s 470 (94 contenders in 47 boats and one fleet) started to follow the same pattern as racing continued late with Switzerland’s Linda Fahrni and Maja Siegenthaler, winners of the Test Event in Aarhus this time last year, dominated from start to finish. But it was the French who had the best day. Camille Lecointre - the Rio bronze medallist - and her new crew, Aloise Retornaz, were a clear second in the first race and managed sixth in second race, where the Swiss finished thirteenth. With so many changes in the women’s fleet crews in the last couple of years the results were not such a surprise. Britain’s gold medallist in Rio, Hannah Mills and her new crew, Eilidh McIntyre (GBR), had a tougher day, in this mammoth field, finishing 9th and 14th to lie 8th overall. Watch the Women's 470 race 1. Watch the Women's 470 race 2. “As a sailor trying to race in those conditions, you’ve got to be a bit lucky and you also have got to just try and be patient. We had a great start, tried to consolidate and then found ourselves at the back in 15th or 16th at the top mark. But I guess the strength of our partnership is that we just keep chipping away. We’re stoked to finish third. It’s an awesome, challenging venue and I guess that’s part of being at the Worlds right, it’s supposed to be a test. We took the wrong side on the first upwind and we lost a lot on the last 200 metres of the first upwind. Then we had to catch up and we managed to finish 13th but even that was really difficult. We like these waters, it’s complicated and we like shifty conditions. Compared to the men’s fleet, we had a good day – the wind was good, and we managed to race well without any issues, weather wise. It was a tricky start, we didn’t manage to catch the best lane. We just did our best and all that training kicked in. We managed to make some calls which we made some gains on. We did make a couple of mistakes, but it was about minimising them as fast as we could. There were a lot of opportunities in the race too, some sailors above us made some mistakes. We were expecting the weather to be challenging but not as hard as it was today. We’re expecting a touch championship for sure. “That was really trick, it was possibly the hardest day at any event I’ve ever had. Our plan was to keep our fingers crossed and hope for the best, see what came to us and luckily it played us a good hand. A lot of it comes down to the start, if you can get off the start and give yourselves options then that’s why the best guys are usually at the top because they can get off the startline and do what they want to do rather than be told what to do by other boats. 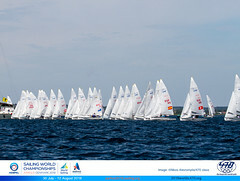 Sailing will be shown live on World Sailing’s YouTube and Facebook Channels from 2-12 August.